KPFA is a listener-supported radio station broadcast from Berkeley. They are currently running a fund drive, which is the only way you can get a limited edition copy of Jack Foley‘s collaboration with Helen Breger, a longtime illustrator for The San Francisco Chronicle. You see, back before photography became the norm for newspapers, illustrators supplied images to go with the articles. 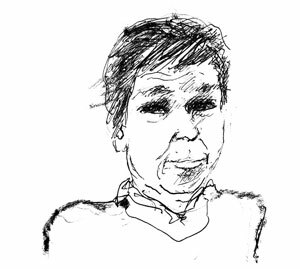 In this fashion, Breger has illustrated the portraits of 30 writers, each accompanied by an original poem/poetic commentary written by Foley. In characteristic fashion, the book includes a CD with audio recordings of Foley reading each poem. “Sketches Poetical” is, Foley says, “a play upon the title of William Blake’s first book, Poetical Sketches.” Authors include Ezra Pound, T.S. Eliot, E.E. Cummings, Allen Ginsberg, Jack Kerouac, Neal Cassady, Kenneth Rexroth, Kenneth Patchen, Michael McClure, Gary Snyder, Robert Creeley, Robert Duncan, James Broughton, Al Young, Josephine Miles, Kay Boyle, Shirley Kauffman, Amiri Baraka, and many others. A few pages from the book have been published in the Spring/Summer 2011 issue of The Tower Journal, from which the above two sketches are taken. Follow this link to see more and to read—and hear Foley read—the poems. You can get Sketches Poetical—and support KPFA—for a $50 premium on Jack’s show Cover to Cover every Wednesday at 3pm, where you can also get his 1,300 page chronoencyclopedia of California poets and poetry Visions and Affiliations.